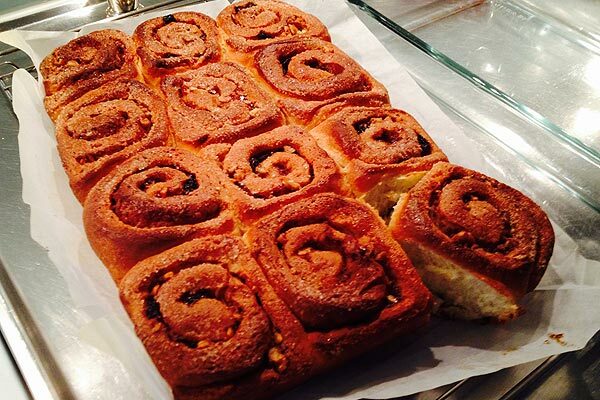 This recipe will produce super yummy cinnamon buns – these are wonderful, moist and sticky. I make these often and they don’t hang around long. If you have a problem with nuts just leave them out! Traditionally Swedish cinnamon buns are smaller, dry and more compact. Swedes generally don’t go in for nuts, raisins, swirly sugar stuff. They like a sweetened bread without a lot of bells and whistles. There are a lot of purists out there! Being American I grew up on big fat sticky cinnamon buns with a little extra everything. If the truth be known I can wake up at night thinking of Dunk’in Donuts cinnamon buns. For which there is no substitute. For those in who grew up in New York like I did who could forget a box of Entemanns Cinnamon Buns? But I have to say they are nothing like they used to be 30 years ago. But what is? I hope you enjoy this recipe! 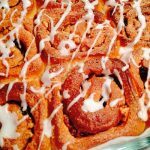 Almost everyone has a Cinnamon Bun recipe. In Sweden this would be considered the deluxe version. I hope you like them as much as we do. 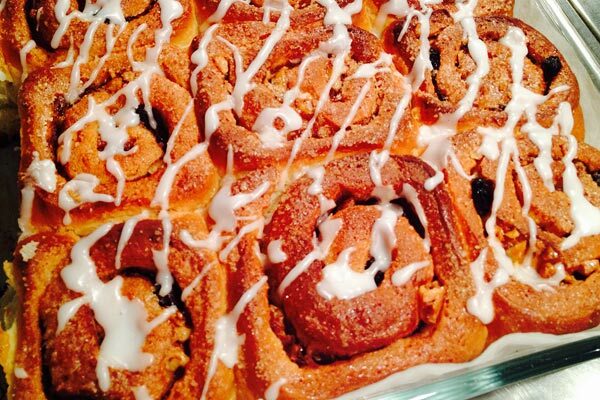 Delicious, sweet and sticky, one of my favorite recipes for cinnamon buns. Truly worth the effort. 25 grams yeast fresh, or one 12 gram packet of dry yeast. 2.5 dl milk at room temp. 75 grams nuts, peacans, walnuts or hazelnuts or a combination of any two or all three. In the bowl of a stand mixer add the rest of the milk, egg, white sugar and mix together. Add the yeast once dissolved to the milk mixture. Incorporate it. In the bowl of the mixer add the flour 1/3 of it at a time. Add the softened butter when you begin adding the flour. Set the mixer for medium. Set the bowl aside and cover with plastic wrap and let rise for about 1 hour. Until it has doubled in balk. In a small bowl mix the butter and cinnamon well. Chop the nuts and set aside and measure out the raisins. Line a rectangular baking pan, or glass pyrex dish with a piece of baking paper. No greasing necessary. 25 x 35 cm. Lightly dust the top of the counter and rolling pin. 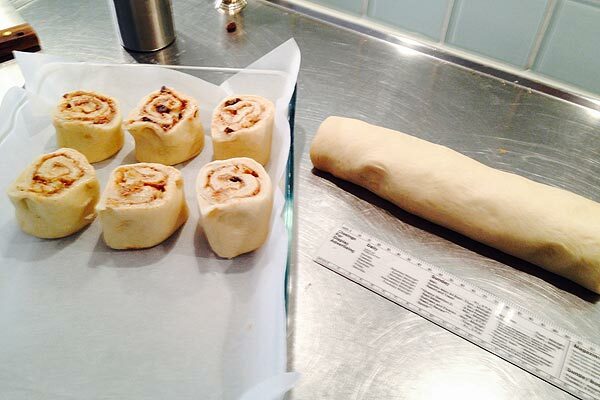 Roll out the dough into a rectangle of 25 x 50 cm. Once the right size take the butter and spread it evenly over the whole thing. 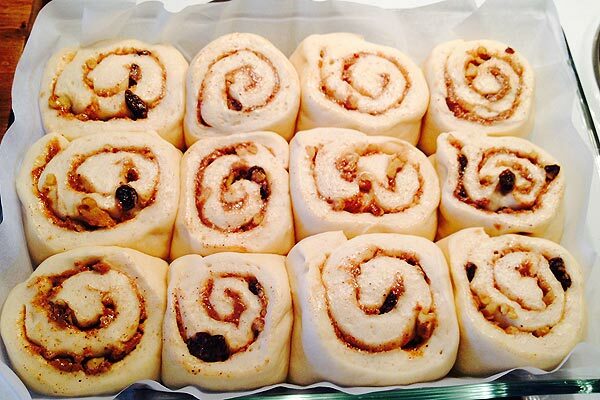 Then take the chopped nuts and raisins and evenly distribute them over the dough. Place them evenly into the prepared baking pan. Cover with a cloth and let raise again for an hour. In the mean time boil the final 1/2 dl of water and white sugar. Let boil for about 3 minutes and let cool. Once the buns are risen brush the top of the buns with the sugar water mixture and then take the raw sugar and sprinkle it evenly over the whole thing. Place in the middle of a preheated oven for 30 to 35 minutes. When done remove from the oven and let the whole pan cool on a rack for at least an hour. When cool mix the powdered sugar and lemon juice. Add just enough water to make the sugar into a thick mass. Using a spoon or make a paper cone and drizzle the sugar frosting over the buns. What can I say about cinnamon buns. Here in Sweden it's the national bun. If you serve these with coffee you know everyone will be happy and since we drink so much coffee here they are always perfect. Easy to make and great for a treat. You can substitute the raisins if you like for dried cranberries or other dried berries.